Hamburg, Germany | March 28, 2019– For the international aviation industry, it is one of THE high- lights in the annual calendar: the Aircraft Interiors Expo in Hamburg, the leading global trade show for everything to do with aircraft cabins, passenger experience and on- board products. And in 2019, the event is celebrating its 20th birthday. Thousands of airline managers, manufacturers, suppliers and journalists from all over the world will gather in the German city from 02 to 04 April, to view and discuss the latest trends in aircraft seats and in-flight entertainment at more than 500 stands. The absolute vanguard amongst the innovative concepts this year will be crowned by an international expert jury on the evening of 2 April at the Crystal Cabin Awards, an initiative of Hamburg Aviation. This year, Hamburg’s First Mayor, Dr Peter Tschentscher, will be visiting the Aircraft Interiors Expo for the first time. During a tour of the event on the morning of Wednes- day 3 April, he will get an overview of Hamburg’s participants in the world’s biggest aircraft interiors show. The northern German metropolitan region is considered the world’s most important site for this rapidly growing segment. It is not just major corporations such as Airbus and Lufthansa Technik that have concentrated their world- wide activities in the field here. Dozens of suppliers of all sizes, research institutions, such as the ZAL Center of Applied Aeronautical Research and, on the university side, the Hamburg University of Applied Sciences have a focus on aircraft interiors here. Worldwide, air transport is growing rapidly, and already, around the globe, more than 120,000 flights take off every day, carrying over 10 million passengers. The atmos- phere and services on board are increasingly serving the role of a “business card” for airlines, especially in the premium segment. At the same time, every square centimeter of space is precious. If the aircraft cabin were an apartment, the monthly rental would equate to some 1,400 euros per square meter. Just how to increase passenger comfort in a tightly packed Economy cabin therefore continues to be one of the most important areas for products at the show. Krueger Aviation and zweigrad Design present a complete re-invention of the on- board lavatory in their multicultural aircraft toilet. The re-thought lavatory can be used in a sitting position or, in line with Asian cultures, squatting. The diverse utility of the room is completed with a seating area for getting changed prior to landing and a large baby changing table with animated figures. (Hall B6, Stand 6B70). Pretty much right next door, but with a very different focus, Airbus partner Altran will for the first time be demonstrating its Printed Electrics technology that won a Crystal Cabin Award in 2018, with live printing of electronic wiring for the cabin. Hamburg companies Silver-Atena and jetlite are presenting the jetlite Controller in Hall B1 (1A58). The device uses scientific algorithms and current flight data to calculate the optimal lighting scenario for the cabin. This has been proven to reduce the sense of jetlag. The first point of contact for all Hamburg businesses and organisations this year is once again the Hamburg Aviation stand in Hall B6, 6B90, a shared presence with the ZAL Center of Applied Aeronautical Research. This is part of the “Hanse Pavilion”, the largest joint stand at the Aircraft Interiors Expo, organised by the Hanse-Aerospace supplier association. The Hamburg Aviation cluster is also politically active and will be holding a reception during the trade fair for a delegation of Canadian aerospace representatives, including the Minister of Economy for Québec, Pierre Fitzgibbon. The delegation is spend- ing the entire week in northern Germany. The Aircraft Interiors Expo, organised by Reed Exhibitions, is celebrating its 20th birthday in 2019. It has become part of the larger Passenger Experience Week, which begins on Monday 1 April with the Passenger Experience Conference (PEC) and continues with “AIX” and two other parallel trade shows, the World Travel Catering & Onboard Services Expo (WTCE) and Passenger Technology Solutions (PTS). All these events are taking place at at the Hamburg Messe trade fair site. What To Expect: Delta Introduces New Branded Boarding Order January 23. January 23, 2019– Starting Jan. 23, on Delta flights around the globe boarding zones will be renamed to reflect the branded fare purchased, while still prioritizing customer loyalty. The new branded boarding order introduces additional boarding groups, encouraging fewer customers to line up in the gate area at any given time and easing crowding during the boarding process. This marks the latest evolution in Delta’s multi-year work to bring consistency, simplicity, clarity and less stress to the gate and boarding experience, efforts that have driven all-time high customer experience scores. 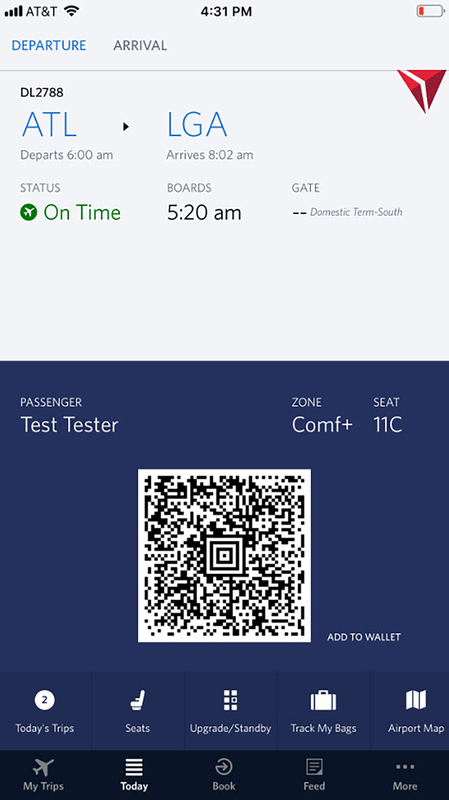 Customers will see the branded fare purchased, or Sky Priority, on their mobile or printed boarding pass – this indicates their boarding group. Instead of featuring numbered zones on gate screens and signs, and in boarding announcements, customers will see and/or hear the branded fare they purchased or Sky Priority, letting them know it’s time to board. For most customers, their place in the boarding order doesn’t change – the new name simply makes it easier to recognize. SkyMiles Medallion Members* and eligible Delta SkyMiles American Express Credit Card Members will continue to receive priority boarding. Customers will also see new color accents distinguishing each of Delta’s fare products and Sky Priority on screens and signage at the gate. Those same new colors associated with each branded fare will be visible to a small number of customers in the digital shopping experience to start. 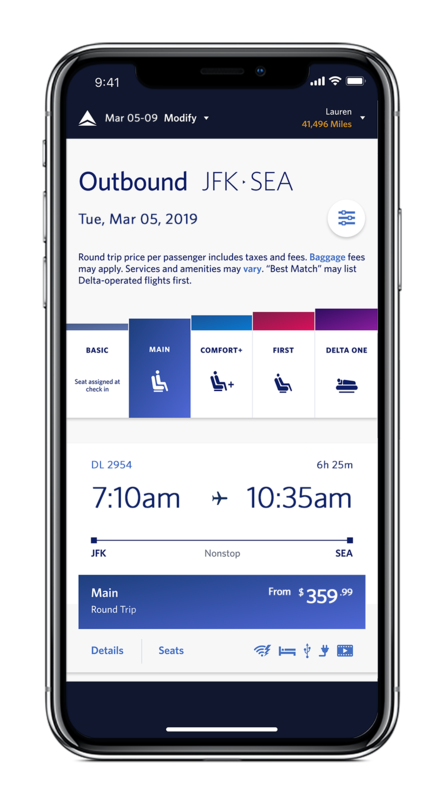 A gradual roll out to all customers on delta.com and the Fly Delta app in 2019 is in accordance with best practices for large digital changes. And, this phased approach will allow Delta to gather customer feedback for continuous improvements. 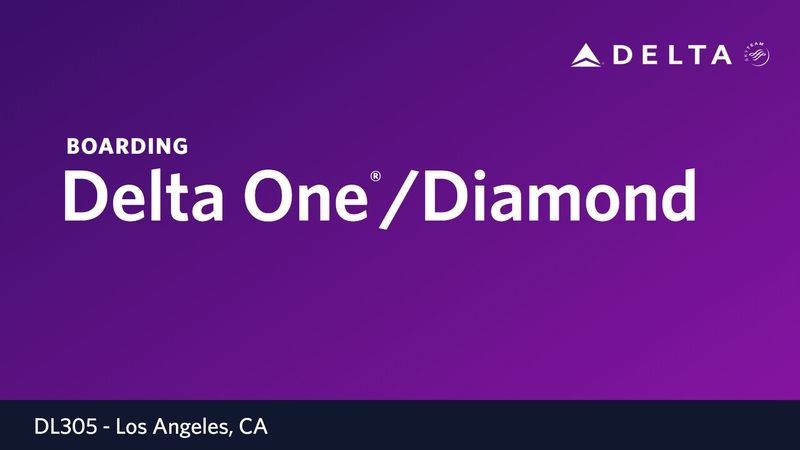 Branded boarding builds on Delta’s latest boarding enhancement, the addition of zone 4 in 2018 for Basic Economy customers. This change resulted in better customer satisfaction scores in every zone, with dramatic improvement for the reduced number of customers in zone 3 and double digit improvement for Main Cabin zones. Delta continues to put boarding under the microscope, looking at new ways to organize and test concepts – such as the use of digital screens instead of static boarding signage, like pillars. To help keep customers informed, the airline has also been a leader in adding larger display screens above the door to Jetways and pushing boarding notifications from the Fly Delta app. Panama City | November 20, 2018– Latin American air travel is expected to double in the next two decades thanks to anticipated growth of the region’s middle class from 350 million people to 520 million by 2037, and evolving airline business models making travel more accessible. Passenger traffic in the region has more than doubled since 2002 and is expected to continue growing over the next two decades — increasing from 0.4 trips per capita in 2017 to nearly 0.9 trips per capita in 2037. Historically, domestic traffic was the fastest growing segment, but in 2017 intra-regional traffic grew faster. Less than half of the region’s top 20 cities are connected by one daily flight, creating a great potential for the region’s airlines to build intra-regional traffic. According to the latest Airbus Global Market Forecast (GMF), Latin America and the Caribbean region will need 2,720 new passenger and freighter aircraft to meet this rising demand. Valued at US$349 billion, this forecast accounts for 2,420 small and 300 medium, large and extra-large aircraft. This implies that the region’s in-service fleet will almost double from the 1,420 aircraft in-service today to 3,200 in the next two decades. Of these aircraft, 940 will be for replacement of older-generation aircraft, 1,780 will be accounted for growth, and 480 are expected to remain in service. “We continue to see growth in the region’s air transport sector, despite some economic challenges. With two of the world’s top 13 traffic flows expected to involve Latin America, and traffic expected to double, we are very optimistic that the region will continue to be resilient. Also, with intra and inter-continental demand rising, Latin American carriers will be in a very strong position to increase their footprint in the global long haul market segment.” said Arturo Barreira, President of Airbus Latin America and Caribbean, at the ALTA Airline Leaders Forum. Airbus has sold 1,200 aircraft, has a backlog of nearly 600 and nearly 700 in operation throughout Latin America and the Caribbean, representing a 56 percent market share of the in-service fleet. Since 1994, Airbus has secured nearly 70 percent of net orders in the region. Air Transport IT Summit, Jaipur, India | March 22, 2018– With its leading Smart PathTM biometric solution for ID management now rolled out globally, air transport IT provider SITA is well poised to deliver a seamless, paperless travel experience for passengers across India. Orlando, Florida | March 8, 2018– Passengers flying with British Airways from Orlando International Airport (MCO) to London Gatwick are enjoying a secure and seamless departure with new biometric boarding at the gate. A quick photo is all that is needed to board the international flight – no passport, no boarding card – thanks to innovative technology. SITA, the global air transport IT provider, integrated automated boarding gates with the US Customs and Border Protection (CBP) and airline’s IT systems to allow the necessary checks and authorize boarding. Greece | March 6, 2018– Responding to the ever-growing expectations and demands of the traveling public, Hermes Airports announces the introduction of a new online system, displaying the routes available to and from Larnaka and Pafos international airports; connecting the Cypriot airports with the rest of the world. http://www.hermesairports.com/en/larnakahome/destination-map-lca. Visitors to our website using this new service have the possibility to locate all the available routes offered from/to any destination around the globe, both through direct and connecting flights. By simply adding the travel dates and desired destination via an automatic research, the system displays all the possible options or routes available to the public and transfers the user directly to the linked airline and its website in order to either to book a ticket or to further explore his/her choices, based on the airline’s specific flight schedule. With this new service, Hermes Airports website is upgraded, offering a complete platform of information to the public which includes a lot of useful information regarding departures and arrivals, options concerning the airlines and their routes and also a variety of information regarding the services offered by Larnaka and Pafos airports and material regarding the tourism product of Cyprus. Mumbai | November 23, 2017–As passengers in India become more familiar with the use of technology – particularly mobile – they expect to use it more on their airline journey. This is according to the 2017 SITA Passenger IT Trends Survey, a global survey released by IT provider SITA and co-sponsored by Air Transport World. While the use of technology among Indian airline passengers remains high at check-in (87%) and booking (52%), 2017 saw tremendous growth in usage at other points in the journey. The research showed while adoption remains low, self-bag drop usage climbed to 21% from 12% in 2016. 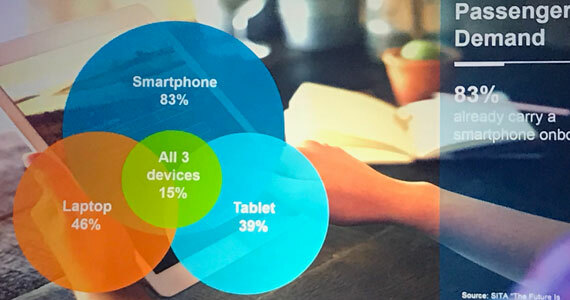 Passengers are also demanding new mobile services with 83% saying that they would definitely use flight updates on their mobile. And they would use their mobile for baggage services too: 82% would report mishandled bags and 79% would track their bags in real-time. This comes as no surprise with more than one billion Indians using at least one mobile device in 2016 of which 300 million are using a smart device. The research shows 54% of passengers would rather opt to use self-bag drop than go to an airline check-in counter, compared to 33% globally and well ahead of current usage. Another area that is gaining the attention of passengers is the use of biometrics. India’s national biometric identity system is the largest in the world with over one billion enrolled members and Indian passengers have shown greater willingness to use biometrics to speed up their journey through the airport. In 2017, 70% of passengers in India said they would definitely use biometrics if given the option, removing the need to show a passport or boarding card at key points in the airport. This was well above the global average of 57%. India’s Ministry of Civil Aviation is working with the air transport industry to create a “digitally unified flying experience” where citizens’ national biometric identification cards and foreigner’s passports are optionally linked with the databases of airlines, airports and other stakeholders to deliver a seamless, paperless travel experience at every step in the journey. The survey was conducted across seven Indian airports, representing 71% of passengers in the country. As you probably know, the Trump administration is considering banning laptops from the passenger cabins of all international flights to and from the US, and homeland security secretary John Kelly was quoted as saying when asked if he was going to ban all laptops on all flights to and from the US: “I might,” he said. The existing ban set in place earlier this year affects some 50 flights per day from 10 cities, mostly Middle Eastern, such as the United Arab Emirates, Qatar and Turkey. Furthermore, the U.S. Department of Homeland Security introduced a restriction on personal electronic devices in March, mandating anything larger than cellphones or smartphones be sent via the traveller’s baggage – so no tablets either. Clearly this does not affect airline provided tablets for IFEC, as Emirates is loaning tablets to passengers in upper classes, obviously keeping the the folks in front happy as their laptops/tablets ride in their suitcases down below. Currently, several news outlets report that the U.S. is considering extending the ban to other locations, including Europe. Ostensibly, airlines and countries worldwide could do the same. In fact, IFExpress has heard that Australia is presently considering a ban as well. The folks at Digital Trans noted: “Kelly added that Homeland Security planned to “raise the bar for – aviation security much higher than it is now,” and spoke of “new technologies down the road,” though declined to offer any details.” Furthermore, among the enhanced security measures that will be forthcoming will likely be tighter screening of carry-on items to allow Transport Security Administration agents to discern problematic items in tightly stuffed bags so we all will probably be affected – laptop or not. Hey, this ban could end up way bigger than anyone imagined. However, not everyone is sold on the restrictions and this was noted recently in Aviation Week – “In a statement May 23, AAPA (Association of Asia Pacific Airlines) director general Andrew Herdman said, “The ripple effects of such measures, and their proposed wider expansion, threaten to disrupt the global economy and impose far greater costs on society with no tangible public security benefits. This would only serve to further the aims of the terrorists, who measure their success by how much society over-reacts to their provocations. Rather than focus on generalized screening of innocent passengers, past experience with evolving threats and terrorist plots repeatedly highlight the critical importance of effective intelligence gathering and analysis.” Screening may be fine, but still one bad device could cause a lot of cabin damage – and all it takes is one. Many say that the ban expansion will force a lot of passengers to send their laptop and tablets to their destination via luggage in the hold, or just leave them at home. IFExpress sees several potential issues with this scenario. Firstly, large quantities of laptop batteries in the aircraft hold could potentially increase the risk of combustibility, which we all know has been an issue – and not just for laptops (think back to last year with the Galaxy 7)! After all, Lithium batteries can fail. But even beyond that some travelers have told us that they won’t ship laptops in luggage because of the potential for theft – especially in some parts of Eastern Europe, Africa, and other locations. Additionally, if you do carry your laptop in your baggage, you might want to also carry a copy of the PC sales receipt with you as well, because if the bag is “lost”, you need proof of it’s value to get repaid – be sure to check out the rest of the article as it is pretty good as well! If the issue is battery size, what size limit is there or is the issue resolved with no laptops? Will this new security change be a boon to smartphone usage inflight? And if so, portable keyboards (with Apple and Android phones) will be seen a lot more? Or for another solution – can you imagine the cost and hassle of a secure, lockable cabin laptop storage enclosure? And the ensuing mess of storing and retrieving your laptop before and after a flight? Bad idea – rule that one out! So in the future if this security increase passes and you want to “laptop work” onboard, you might want to consider a good smartphone (perhaps one with the biggest screen possible) and at least 128 Gb of memory, a secure device for storing your data, and a portable keyboard, and a mouse (if that works on a phone). You may want to figure a way to support it while watching some form of entertainment – not to mention power. You will need power either from the plane or brought with you on a “brick”- and that brings up another issue, what size Lithium Ion power device will be allowed? Is this getting crazy, or what? However, with the size of some PC’s getting smaller (credit card size), could this be a possible carry-on computing solution when combined with a small keyboard, portable Li-ion cube and a small screen on an iPod or a phone? Check this out because they are getting smaller as well. Additionally, here are 10 tips for mobile security that will help keep all that portable stuff safe while you do travel, big laptop or not. And lastly, since we are on the subject, here is another good link on the potential laptop ban line as well. SAFRAN’s deal to acquire Zodiac has a new offering that drops their original price by $1.1 B, to a little over $9.5 B. It was a “drag” when we learned how many how many antennas are on B787. Why? Because we were so wrong? If you said there are than 20, you are correct! Check it out. Raunheim, Germany | February 16, 2017– Everyone is talking about digitalization. Many companies are wondering how to future-proof themselves in the digital world. Lufthansa Systems turned this vision into reality a long time ago. For years, the aviation IT specialist has been advising and supporting airlines in their digital transformation, demonstrating what sustainable airline processes can look like and helping customers implement concrete projects. The spectrum includes solutions and consulting services for improving the efficiency and differentiation of all aspects of an airline as well as for optimizing the entire travel chain for passengers. Personalized Air Travel Services: Personalized solutions aim to enhance the passenger travel experience. New digital and individual services and apps, which can be used before, during and after a flight, ensure that passengers are addressed directly and personally. BoardConnect is one example. This digital platform enables passengers to access wireless inflight entertainment on their own smartphones and tablets, while offering additional functionalities for flight deck and cabin crews – with or without an Internet connection. The new inTime app is another example. It calculates how much time passengers will need to reach their gate punctually from their current location. Both the traffic situation outside the airport and the waiting times at check-in and security are taken into account here. The timings are based on (anonymized) data from real passengers, so the app gets more intelligent over time. Dynamic Distribution Management: Dynamic distribution management makes it possible for airlines to increase their revenues by offering ticket and service packages directly to travelers. The New Distribution Capability (NDC) standard of the International Air Transport Association (IATA) is promoting this development and significantly affecting the distribution structures of airlines. Together with partners, Lufthansa Systems provides solutions for the entire NDC process, including offer and order management, dynamic pricing, and billing with the Sirax/RA revenue accounting solution. Airlines benefit from improved customer loyalty through more individualized offers, with lower distribution costs and higher revenues. Safe & Efficient Flight Operations: Optimization and efficiency in all aspects of flight operations are the crucial aspects here. Simplified processes, improved routes, reduced fuel consumption and shorter handling times (including for crews and maintenance work) not only generate considerable savings potential, they also increase flight safety. For example, the digital navigation maps of the Lido/Navigation product line are becoming more and more dynamic. In the near future, they will be able to seamlessly display all flight processes from gate to gate. With an on-board Internet connection, additional smart functions in the maps can show information that is relevant to specific situations during a flight. This increases the pilots’ situational awareness. Reliable Air Travel Experience: New developments in the field of flight operations revolve around passengers and their positive travel experience. If disruptions or delays do occur, these solutions aim to minimize the negative effects on passengers and communicate changes in a transparent way. This is essential to an airline’s success. The successful NetLine/Ops ++ operations control solution helps here with its innovative eye-tracking feature. Employees in an operations control center sometimes have to monitor six screens showing current flights and information about potential disturbances. Analyzing the eye movements of operations controllers with the help of eye-tracking technology ensures that no important warnings or disruption notifications are overlooked. Westchester, NY | June 29, 2016– Bliss Jet today launched the first individually-ticketed private jet flights between New York and London on a regular schedule. This innovative new service offers sophisticated travelers an ultra-exclusive transatlantic travel experience that is significantly more efficient, convenient and secure than the airlines’ first and business class products. Pre-screened travelers, who are accustomed to flying private or in premium cabins, can begin taking advantage of Bliss Jet’s new class of service between New York’s Westchester County Airport and London’s Biggin Hill Airport in September. Bliss Jet is now accepting reservations. Bliss Jet passengers will be able to choose custom meals from an extensive menu, access a variety of inflight entertainment options, and connect to worldwide Wi-Fi. Upon request, Bliss Concierge services will arrange ground or helicopter transportation, or private charters for passengers flying to another location. Bliss Jet flights will depart from New York on Sunday nights so that passengers will arrive at London’s uncrowded Biggin Hill Airport refreshed, relaxed, and ready for a productive work week. Return flights depart from London after lunch on Friday so passengers can schedule morning meetings and arrive back in the United States for a family dinner or a Broadway play. Travelers accustomed to private jet charter will appreciate that Bliss Jet provides virtually the same amenities at a fraction of the cost. Seats on the 14-passenger jets will cost $11,995 each way. Unlike crowded business class sections, Bliss Jet will limit seat sales well below the maximum aircraft’s capacity for extra comfort. Every flight will be operated by a highly-experienced carrier and crew on aircraft judged superior by respected third-party safety audit standards such as Wyvern Wingman, ARGUS Platinum ISBAO and the Air Charter Safety Foundation. The initial schedule of flights will be operated for Bliss Jet by Jet Access Aviation under a Public Charter approval from the U.S. Department of Transportation. Bliss Jet CEO David Rimmer is an experienced premium air travel and charter industry innovator. He will lead a seasoned team of private jet professionals who will ensure Bliss Jet passengers receive the highest level of customer service. A pioneer with more than 15 years of private aviation leadership experience, Rimmer has created exponential growth and generated significant success in the private aviation market by championing industry-leading safety standards and business practices. Bellevue, WA | June 23, 2016– T-Mobile just showed again why it is the Official Sponsor of Summer. * The Un-carrier today announced it’s unleashing summer travel, giving customers unlimited high-speed data, up to 4G LTE speeds, throughout Europe all summer long. But, of course, T-Mobile didn’t stop there. For those travelling this weekend, T-Mobile announced it’s giving absolutely everyone – including Verizon and AT&T customers who never get thanked by their carrier – a full, free hour of Wi-Fi on all Gogo-equipped domestic flights—just to show everyone what it feels like to #GetThanked with the Un-carrier. On top of that, T-Mobile today announced that Un-carrier customers can roam worry-free in Belize starting July 1st. Belize is joining the long list of 140+ countries and destinations where Simple Choice customers get unlimited data and texting and low, flat-rate calling while travelling abroad. Far and away the single most popular overseas travel destination every summer is Europe, where more than 2.5 million Americans are expected to vacation this summer. So, starting July 1st all the way through August 31st, T-Mobile’s giving Simple Choice customers unlimited high-speed data across all of Europe** – all at absolutely no additional cost – so you can share, Skype, snap and scope every moment of your European holiday. Customers get the highest available data speeds wherever they travel across the continent. And, as always, texting is free around the globe with T-Mobile, and calls are just 20 cents a minute throughout Europe and a host of other destinations. That couldn’t be more different than the carriers’ approach to tax and toll everything you do with your phone outside the country. For example, if a Verizon customer used their phone normally during a two-week holiday in Rome, they could come home to upwards of $2,730 in international roaming fees. If you travel with T-Mobile, your phone just works – exactly like it should – at exactly $0 extra for unlimited data and texting. And the best part? Customers don’t have to lift a finger to get these Un-carrier benefits. All of which makes T-Mobile the only choice for summer travel. Just a few weeks after unveiling Un-carrier 11, an industry-rocking move dedicated to thanking customers, the Un-carrier’s now offering everyone a chance to #GetThanked like a T-Mobile customer. The millions of Americans expected to fly this weekend can get a taste of what it means to be part of the Un-carrier—even those long-abused AT&T and Verizon customers. Starting this Friday, June 24 through Sunday, June 26, passengers on any domestic flight with Gogo service can automatically get one free hour of Wi-Fi on their smartphone, courtesy T-Mobile. That’s a free full hour coming and going on every flight with Gogo service—more than 33,000 flights this weekend alone! “We want to show everybody what it feels like to #GetThanked and travel like a T-Mobile customer!” said Legere. While this offer for everyone flying this weekend ends Sunday at 11:00pm ET, T-Mobile customers will always enjoy free messaging and texting all flight long, plus a full free hour of Gogo Wi-Fi on your smartphone on all Gogo-equipped domestic flights, courtesy the Un-Carrier. For more information on what it’s like flying with T-Mobile, visit www.t-mobile.com/offer/free-in-flight-wifi-texting-uncarrier. Finally, for the tens of thousands of Americans who travel each year to Belize to enjoy its natural beauty and pristine beaches, T-Mobile also announced that Belize is will be part of Simple Global starting July 1st. Meaning T-Mobile customers can travel to all 20 countries in South & Central America – from the tip of Patagonia in Chile to that scuba spot in Belize – and never have to worry about data roaming or texting charges. With Simple Global, which launched in 2013, T-Mobile Simple Choice customers get unlimited data and texting and low, flat-rate calling for just 20 cents a minute in over 140 countries and destinations around the world. For more information about travelling with T-Mobile, check out http://www.t-mobile.com/optional-services/roaming.html. Melbourne | June 7, 2016– Melbourne Airport continues to improve passenger services with a recent trial that has included self-service boarding with global travel technology provider SITA. The airport is focusing on using technology in new ways to improve processes to make the journey smoother for its passengers and the airlines that serve them. Manchester, England | February 22, 2016– CTI, the leading regional travel management company, has investigated and identified the impact of air delays and cancellations on clients and created an offering to help. As a trusted travel partner for hundreds of firms across the UK, CTI conducted an analysis of airline delays, with initial findings suggesting that 5% of its clients’ flights are affected by delay or cancellation. CTI is the only UK travel company to currently offer this service, and its clients will be able to claim compensations averaging 400€ depending on distance flown. CTI has partnered with AirRefund, the claim management service, to provide its clients with an easier approach to compensation for flight delays, cancellations and overbookings. It will be the first independent UK travel company to partner with AirRefund. With the service available to all of CTI’s clients and their employees, it’s the latest addition to a network of trusted travel partner suppliers that ensure CTI’s clients receive excellent value and superior service. Clive Wratten, CEO of CTI, said: “We have identified the need for clients to easily claim for disrupted flights, and we are pleased to be the first independent UK travel company to offer this service. Atlanta, Georgia | February 10, 2016– Miami Airport today launched its new mobile app, which is designed for passengers and all airport users. This is the first airport app in the USA to use the latest technologies, including Bluetooth beacons, to get the right information to the right people, when and where they need it. Developed by IT provider SITA, the app presents an easy-to-use interface and gives travelers personalized updates, directions and tips based on their location and needs. United Kingdome | December 9, 2015– Future Travel Experience (FTE) has released the Onboard 2025 Think Tank vision – a first of its kind project, which has brought together senior figures from across the air transport industry to define the narrow-body in-flight passenger experience of 2025, and identify the opportunities and challenges facing travel industry stakeholders. The 50-page presentation can now be downloaded for free, having previously been unveiled at Future Travel Experience Global 2015 in Las Vegas and then presented at Future Travel Experience Asia EXPO in Singapore last month. The Onboard 2025 Think Tank presentation charts the future trajectory of the in-flight experience on narrow-body aircraft, and was co-created by Ingo Gäthje, Head of Cabin Design Office, Airbus; Bjørn Erik Barman-Jenssen, Senior Vice President Ground Operations, In-flight Services & Cargo, Norwegian Air Shuttle; Neil James, Executive Director of Corporate Sales & Product Management; Panasonic Avionics Corporation; Rodrigo Llaguno, Vice President – Customer Experience, Avianca; and Mike Crump, Product & Innovation Director, Honour Branding. The pioneering vision was created during brainstorming sessions over a six-month period and covers four key areas: Cabin Design & Passenger Comfort, In-flight Entertainment & Connectivity, Crew & Passenger Empowerment, and Cabin Classes & Differentiation Strategies. DTI, the inflight gaming & entertainment software house in Montreal has landed a big fish. We wondered when someone in our line of work would do so. Accordingly, interactive IFE will now get some of the best travel content ever. First, if you dont know DTI, check out their website. They cut their teeth on IFE gaming software and are now branching out into interactive entertainment, travel and information on airborne platforms. They have established a deal with Dorling Kinsersly, the DK people who have developed an incredible printed books called “Eyewitness” which encompass general knowledge, interesting places and and intriguing things. Classy stuff. History has shown that inflight interactive guides, especially travel, were met with ho-hum acceptance by passengers probably because of hardware, and the software. No doubt, DTI was aware of this and chose to change the paradigm. With greater capability in todays IFE systems, DTI elected to go ahead and key off the best printed travel (and other subject) guides available , by DK, and design a product around it. The first products is “DK Essential Manager”, and we also understand a general interest Eyewitness Series product (Great for kids and adults who love to learn) is also available now. The fantastic Dorling Kindersly Eyewitness Travel Guides translated for IFE will come along later this year. The image content of DK books is the driver here and and since IFE is a visual media, the Eyewitness Series is perfect for travel or general interest. Today there are well over 121 in the non-travel Eyewitness Series and over 50 city and regional travel guides. The first DTI product, as we mentioned, is flying on Swiss today and we are told there are other customers in the wings. As a matter of fact, we see value in these off the plane, if you get our drift. For you travelers and speaking of digital guides, there are also IPOD Applications developed by DK as well, but we are told when the DTI/DK Travel Series debuts later this year, it will be much content richer and more akin to the printed travel guides. Check out the YouTube link and see if these little applications make sense for your IPOD or IPHONE but look for the interactive DTI product on your next flight. Dorling Kindersley, the world renowned publisher of illustrated non-fiction, has announced a contract with DTI Software to create in-flight entertainment software using DK digital content. DTI is a leader in the In-Flight Entertainment market; with this deal, they have created in-flight applications from the DK list to sell into airlines. Initially, content has been taken from the DK Essential Managers business series – with interactive software available in English, French and German due to be launched on eleven SWISS aircraft from the end of April – as well as content from the world’s bestselling Children’s education series, Eyewitness, and the market leading DK Top 10 Travel series. DK’s digital licensing department has previously worked with DTI on a deal to use Rough Guides content on Singapore Airlines, with travel content now available on the new fleet of A380 aircraft . The DTI deal is the latest success story in DK’s ambitious plan to convert its catalogue into digital formats, using XML technology and digital rights management. The digital content can then be translated into any language meaning that companies can offer, under license, some of the most authoritative content on the market to their customers and clients via books, desktop computers and mobile devices. DK’s entire backlist, spanning three decades, is in the process of being digitally converted, including billions of words and millions of images. The resulting wealth of digital content can be tailored to individual requirements, with current clients including MSN, Promethean, and Motorola.